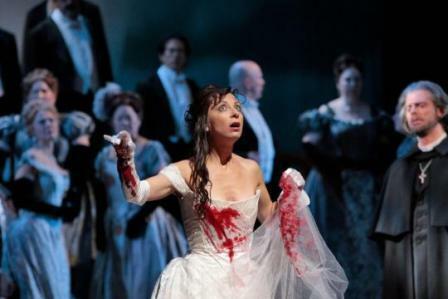 Mary Zimmerman's new production of Donizetti's Lucia di Lammermoor which opened the 2007-2008 Metropolitan Opera season has not been received with universal enthusiasm by the opera going public. There are aspects of it which are slightly troubling, and certain inconsistencies with the libretto. It is unclear why she chose to update the drama from its original late seventeenth century setting to the mid-nineteenth century, but the results of so doing include making the premise for the Ashton-Ravenswood feud rather less likely, and Edgardo's mission to France a very strange whim, given how far beyond the auld alliance Zimmerman's context is. There are gains to be made as well however, since Enrico's straightened circumstances and faded grandeur can be more acutely conveyed when their effects are shown in a dishevelled nineteenth-century reception room as opposed to a seventeenth-century baronial hall, when the interior design options available were more primitive. The look of the whole production, with the exception of the Wolf's Crag scene where the set is rather perfunctory, is fantastic. Act I, Scene 2 in particular, the fountain in the woods, has a set of breathtaking realism, with snow falling throughout the harp solo, and some excellent lighting design to show dawn breaking and the sun gradually rising throughout the love duet. The actual direction of the singers is rather more variable. There is quite a lot of detail in the love duet for instance, which certainly prevented it from seeming like the operatic set piece it has the potential to come across as. Zimmerman has staged it so that at his first reference to having to leave, Edgardo gives Lucia a quick peck on the cheek and attempts a hasty exit. 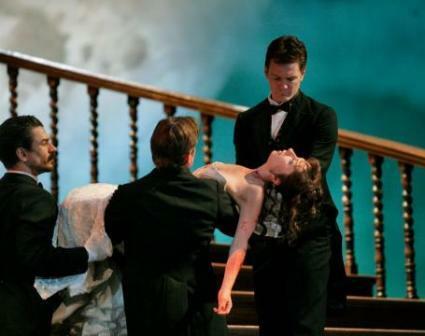 The rest of the duet is played out as Lucia attempting to delay his departure for as long as possible, extracting more kisses and promises of devotion, catching his hand every time Edgardo tries to go. Although this brilliantly suggests the dynamics of young love, it shifted the parameters of their relationship to the extent that Lucia seemed extremely needy and Edgardo rather less keen. Given that his ardour is such that he goes on to kill himself at the news of Lucia's demise, I didn't feel this accurately captured the spirit of the characters or their relationship with each other. 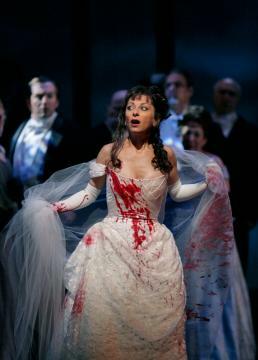 Other scenes, such as the opening outside Lammermoor Castle, scarcely seemed to have been directed at all. The gentlemen of the chorus were left with nothing to do but stand in an evenly distributed rabble, and Mariusz Kwiecien, apparently in the absence of having been given any better ideas, ended up delivering large parts of Enrico's aria front, centre stage, with his arms outstretched, a stand and deliver approach which ceased to be the norm in opera productions quite some years ago. The same thing happened to John Relyea in Raimondo's aria in Act III, Scene 2, and it is difficult to see what his alternative was, since he was getting next to no response from the chorus to the shocking events he was relating. 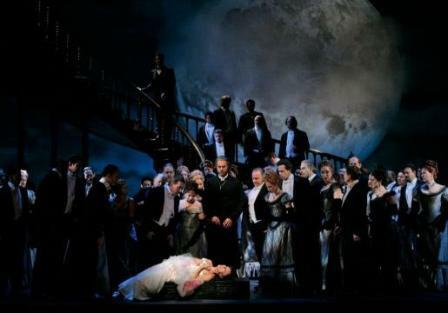 Zimmerman does appear to have paid significant attention to the chorus during the Sextet in Act II, Scene 2, where they have the function of acting as gossips, observing what should be a tense dramatic situation following the sudden entrance of Edgardo after Lucia has signed her marriage contract with Arturo. Unfortunately, tension is lacking from this scene owing to some very distracting staging. Although I do think having a photographer at the wedding is an idea which could have worked very well, the decision to use it during the sextet was misguided. Given what we have seen of the hot blooded Enrico and Edgardo in the preceding scenes in the drama, the likelihood of their having enough passivity to submit to a photo shoot at this point is low, and the absurdness of the situation robs the music of its emotional punch. Other controversial ideas definitely did pay off. Zimmerman's great strength with Lucia appeared to be getting the coloratura to mean something. Initially, I was disappointed with Natalie Dessay (in the title role), who seemed disengaged with the dramatic situation. The trills and flourishes around the words 'E l'onda pria sì limpida, Di sangue rosseggiò!' are clearly in the score to convey fear, but with Dessay they didn't appear to communicate any discernible emotion. But in the cabaletta to the entrance aria, the coloratura was used to express girlish joy, to get at Alisa, and gradually turn her around to Lucia's way of thinking, so that she did eventually relent and allow Lucia to delight in her love. Michaela Martens, as Alisa, acted superbly to allow this to come across. Inevitably, it was the mad scene where Zimmerman and Dessay created their best work. Having been dramatically underwhelming in Act I, Dessay grew in stature during Act II and proved herself to be a strong actress during the duet with Enrico and the wedding scene. But nothing had prepared me for the impact she made in the mad scene. It was quite simply the most impressive and skilful acting I have seen on the operatic stage. Vocally, she was imperfect, and at times rather raddled, but the way she delivered the coloratura and the top notes in the service of the drama was remarkable. The run on the repetition of 'da' tuoi nemici' was very expressive, accompanied by a physical spasm which made it a totally convincing manifestation of her extreme mental state. Countless examples of this abounded throughout the scene, but the top B flat she let out as a cry of pain when she received a shot in the arm from the doctor was particularly deeply affecting, and the rage and victimisation she conveyed through the embellished second verse of 'spargi d'amaro pianto' in response to this was almost painful to watch, so thrillingly immediate did the drama seem. Having chorus members carry her out, so that the crowning E flat came across as Lucia was literally being dragged off kicking and screaming (with no criticism of Dessay's delivery of this note being intended in the use of the word 'screaming'), was a brilliant idea. I'm not sure I have ever seen a piece of opera direction manage to justify an un-written display note with quite that much success. Of course, the mad scene is a hard act to follow, particularly when given such a dramatically compelling performance as Dessay's. However, Giuseppe Filianoti as Edgardo had got the audience very much on side in his earlier scenes through some very emotionally direct phrasing and acting, so that he was well received. His singing earlier in the evening had been appealing, if not completely free of issues, but by the end of his final scene he was absolutely exhausted. He had enough commitment to carry his difficult closing aria off, but his top notes betrayed considerable strain. He was assisted by some very sympathetic and subtle conducing from Joseph Colaneri who ensured Filianoti did not have to linger any longer than necessary outside of his comfort zone. Indeed, Colaneri gave great support to the whole cast in what is inevitably a voice-led opera, allowing them the freedom they needed to create effects consistent with the bel canto style. He also kept a tight grip on the drama in the large set pieces, such as the Act II finale and moved it forward with expert skill. The orchestra was as typically suave as one has come to expect from the Met, but also incredibly delicate when called for, such as the beautifully atmospheric opening bars in the horns and woodwind. Kwiecien and Relyea were both vocally excellent and did what they could to be dramatically involving within the constraints of their scenes, but a very strong impression was made by the young Stephen Costello as Arturo, which is no mean feat in such a small role. His heavy lyric tenor voice struck me as one to watch, and he was pleasing on stage in scenic terms. This was a fascinating evening in the theatre, with a beautiful, if occasionally aimless production, and variable vocal performances. However, its crowning glory, Dessay's electrifying performance of a brilliant staging of the mad scene, will I suspect remain one of the most moving and involving experiences I have had in the theatre for many years to come. Two other celebrated sopranos with strong dramatic instincts, Diana Damrau and Anna Netrebko, are scheduled for a revival of this production in the 2008-09 season, and it will be riveting to see how they each make it their own, so incredibly distinctive and successful was Dessay's achievement.